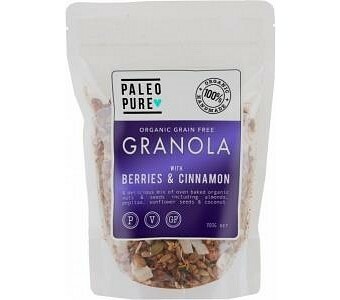 True to their name, Paleo Pure make their granola grain- and gluten-free, without added sugar, and 100% organic. They also make it by hand, mixing nuts, seeds and coconut with blueberries, currants and cinnamon to get the perfect flavour profile before baking it in the oven to bring out the crunch. This mildly sweet granola is delicious on yoghurt, with fresh berries, or all by itself. Ingredients: Almonds, Pepitas, Sunflower Seeds, Shredded Coconut, Coconut Flakes, Dried Wild Blueberries (contains Apple Juice & Sunflower Oil), Currants, Cinnamon, Coconut Oil, Maple Syrup.